On Sunday 2nd of June 2019, I will be teaching an open seminar in Bradford! The event is open to all styles and grades. 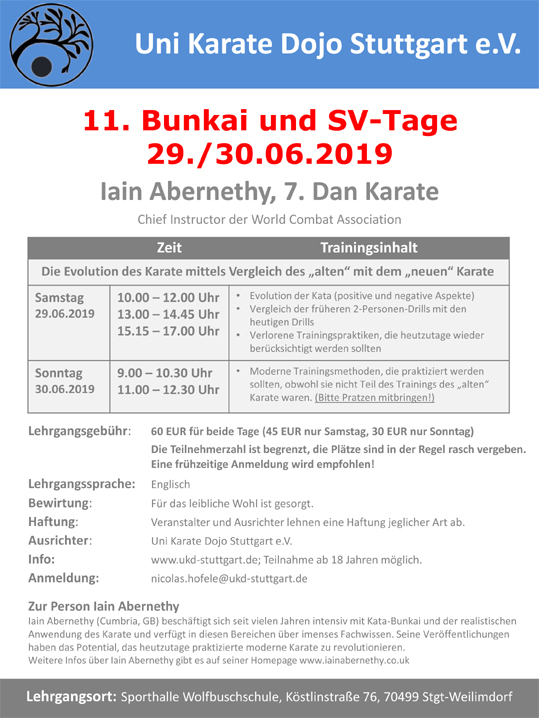 The seminar will cover Gekisai bunkai and my two-person groundwork kata (constructed to help karateka learn groundwork fundamentals). The seminar will run from 10am to 2pm and will be held in Junboku Dojo, Beck Mill, Reva Syke Road, Clayton, Bradford, BD14 6QH. The cost is just £30 per person and to book please contact Andy Jackson via junbokukata@gmail.com or 07761 973553. On Saturday the 22nd of June 2019 I will be teaching an open seminar in Dorking! The venue will be Priory School, Dorking, Surrey, RH4 3DG and the seminar will run from 11am to 3pm. The cost is just £35 / person. Please contact Roy Taylor for details of how to pay and secure your place: 07855282578 (phone) or rtaylorsnr@hotmail.com (email). Free tea, coffee and biscuits will be provided. On Sunday the 23rd of June 2019 I will be teaching a seminar in Wincanton, Somerset! The seminar will run from 10am to 2pm and will take place at: The Honbu, 10 The Tythings Commercial Centre, Wincanton, BA9 9RZ. The theme of the seminar will be “The Training Matrix”! We will look at the strengths and weaknesses of various forms of training and how they should be combined to form a holistic whole. 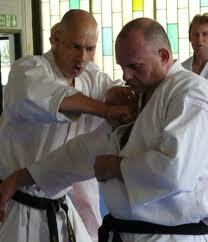 We will look at kata, bunkai, numerous kinds of partner drills, and impact drills. Spares will be available, but please bring your own focus mits if you have them. On Sunday the 29th of June 2019 I will be returning to Unit 1 in Chesterfield! This seminar will cover pad drills based on the Pinan / Heian series. This mix of bunkai with real impact makes for effective and satisfying training! Please bring your own focus mitts if you have them (spares will be available). The seminar will run from 11:30am to 3:30pm and will be held at Unit 1 Martial Arts, Unit 1, Brimington Rd, Chesterfield, S41 7UW. The cost is £30 per person (bring four students and instructor goes free!). On Sunday the 21st July 2019, I will be teaching an open seminar in Wrexham! The theme will be Kururunfa bunkai (no prior knowledge of the kata is needed), methods from the Bubishi, and the link between the two! The seminar will run from 11am to 3pm and will take place at Brymbo Enterprise Centre, Blast Road, Brymbo, Wrexham, LL11 5BT. The cost is £30 per person (four or more students and the instructor goes free).